Each and every consumer will go through various stages of their life. They’ll graduate high school, complete college and eventually get married. Each of these stages will be celebrated. Of course, there is one life event that will be far more exciting than the rest and that is your retirement. When you’re finally ready to hang up the gloves, you’ll want to throw a party and celebrate the event. At this time, you’ll want to download the retirement flyer template and create an advertisement, which can be distributed throughout town. Once you’ve downloaded the template, you will notice that there will be a lot of blank space. The outside of the document and the surrounding area will likely be covered in decorations. Do not let the blank spaces intimidate you. Finalizing the document couldn’t be easier. Simply place the basic details in the blank space. 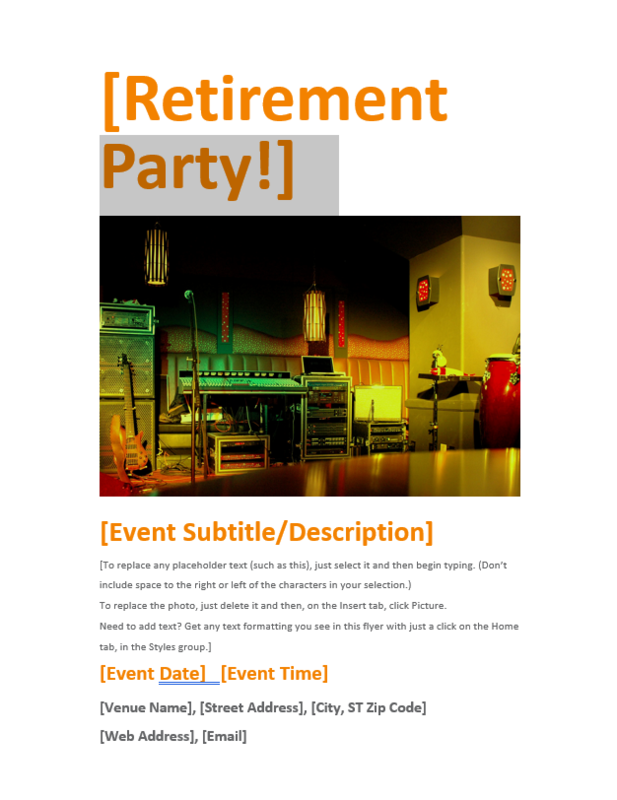 This will include the retiree’s name, the date and time of the party, and its location. Once you’ve finished, you’ll want to go ahead and distribute the flyer. While there are plenty of options, you should definitely make sure the flyers are handed out at the retiree’s place of employment. His or her work colleagues will be very interested in attending the event, so be sure they have access to the flyer!